I have never seen study-at-home audio-visual (AV) physics courses offered by Albert Einstein or AV courses on chemistry promoted by Ernest Rutherford, but I can now say I have seen study-at-home AV courses offered by electronics pioneer Lee de Forest. 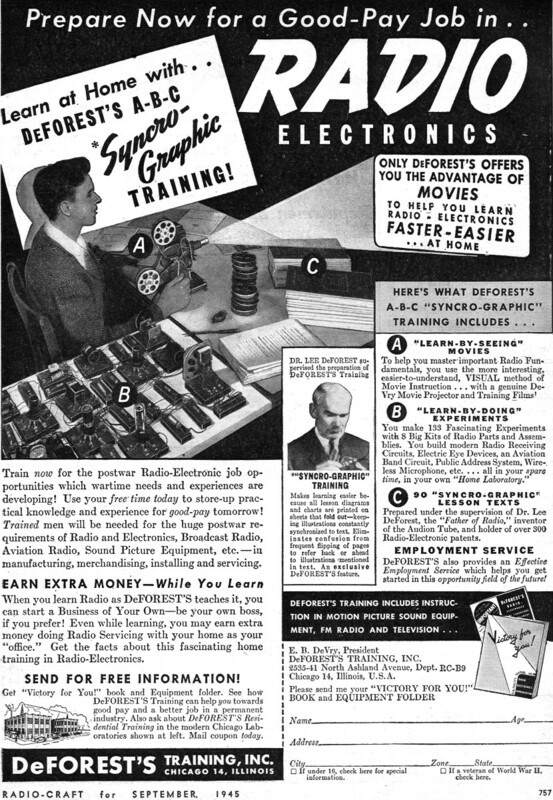 This full-page advertisement for the de Forest's Training, Inc., company of Chicago, Illinois, appeared in a 1945 edition of Radio-Craft magazine. 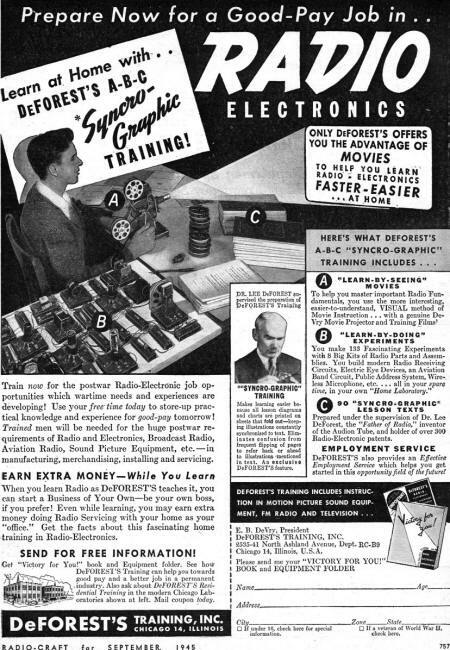 The vaunted (at least by the company) "Syncro-Graphic" training was an early attempt at the paperless classroom. The student watched films reels of instruction rather than "frequent flipping of pages to refer back or ahead to illustrations mentioned in text." It would be another 50 years before useful computer-based-training (CBT) courses became available for home use, but you have to give the "Father of Radio" credit for being ahead of his time in instruction techniques. 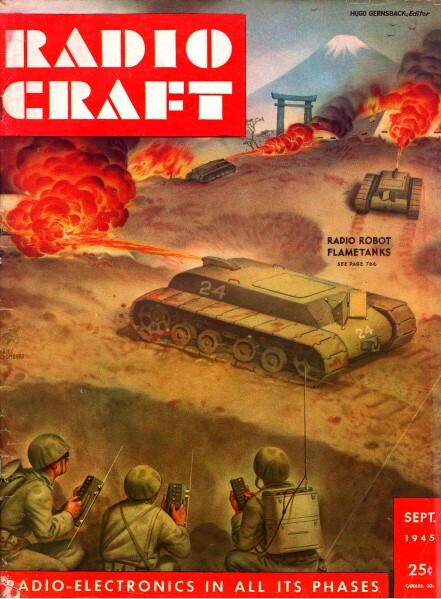 Train now for the postwar Radio-Electronic job opportunities which wartime needs and experiences are developing! Use your free time today to store-up practical knowledge and experience for good-pay, tomorrow! Trained men will be needed for the huge postwar requirements of Radio and Electronics, Broadcast Radio, Aviation Radio, Sound Picture Equipment, etc. - in manufacturing, merchandising, installing and servicing. When you learn Radio as de Forest's teaches it, you cart start a Business of Your Own - be your own boss, if you prefer! Even while learning, you may earn extra money doing Radio Servicing with your home as your "office." Get the facts about this fascinating home ,training in Radio-Electronics. Dr. Lee de Forest supervised the preparation of de Forest's Training. Makes learning easier because all lesson diagrams and charts are printed on sheets that fold out - keeping illustrations constantly synchronized to text. Eliminates confusion from frequent flipping of pages to refer back or ahead to illustrations mentioned in text. An exclusive de Forest's feature. To help you master important Radio Fundamentals, you use the more interesting, easier-to-understand, Visual method of Movie Instruction ... with a genuine DeVry Movie Projector and Training Films! You make 133 Fascinating Experiments with 8 Big Kits of Radio Parts and Assemblies. You build modern Radio Receiving Circuits, Electric Eye Devices, an Aviation Band Circuit, Public Address System, Wireless Microphone, etc. ... all in your spare time, in your own "Home Laboratory." Prepared under the supervision of Dr. Lee de Forest, the "Father of Radio," inventor of the Audion Tube, and holder of over 300 Radio-Electronic patents. de Forest's also provides an Effective Employment Service which helps you get started in this opportunity field of the future! E. B. DeVry, President de Forest's Training, Inc. Please send me your "Victory for You!" o If under 16, check here for special information. o If a veteran of World War II, check here. Get "Victory for You!" book and Equipment folder. See how de Forest's Training can help you towards good pay and a better job in a permanent industry, Also ask about de Forest's Residential Training in the modern Chicago Laboratories shown at left. Mail coupon today.